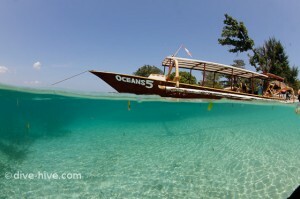 During the holidays in Indonesia we were fortunate to come across Oceans 5 in Gili Air. Not only is the place beautifully designed. 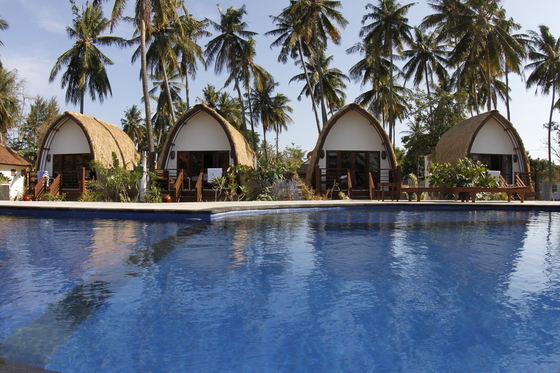 It also offers a lot of extras that makes your staying there memorable for a lifetime. After our arrival we felt immediately welcome and the owners Simone and Sander gave us a little introduction about the centre. The first thing that raised eye-browses was that coffee was free and so was the free refill of drinking water. We were asked not to throw plastic bottles away but to refill them to avoid rubbish. The people that work for Oceans 5 are very very nice and polite. It’s not hard to see that they are really absolutely enjoying what they are doing and have fun sharing their experience and knowledge with other people. This is not the normal “PADI smile” – this is pure passion what these people show. One speciality about Oceans 5 is that the whole dive centre is set up for disabled people. Divers in wheelchairs can reach everything on their own and don’t need further help – including the swimming pool. At the moment that does not count for the beautiful 5 bungalows. But Oceans 5 is building two new ones that will have all the amenities to fulfil a pleasant stay for handicapped persons. These bungalows are most probably finished in December 2011 we were told. Therefore oceans 5 is member of the IAHD (International Organisation of Handicapped Divers). 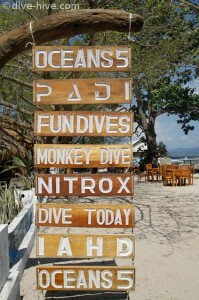 That means partners of handicapped divers can be trained as a certified buddy. 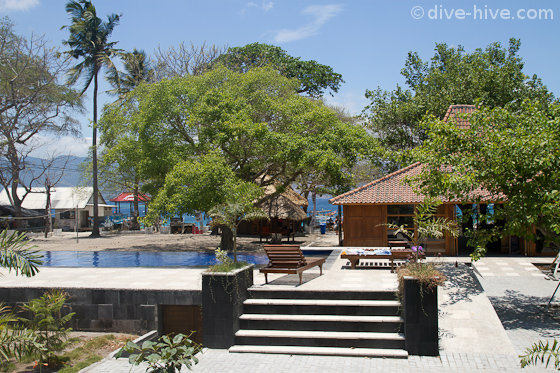 Handicapped divers will be on the same boat then everybody else and visit exactly the same stunning dive sites Gili has to offer. Oceans 5 is very active in terms of reef conservation a protection of the underwater environment. Simone, a behaviour biologist, handed information over to us what exactly the dive centre is doing. At the moment they are trying to safe what is already there (what is a lot) instead of trying too many things at the same time. Prevention will cut down the effort of later conservation is the credo of Oceans 5. 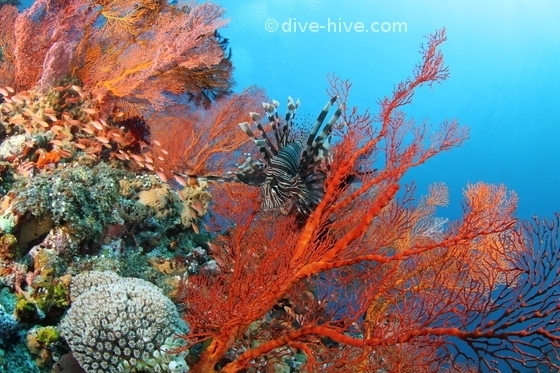 Together with other dive centres on Gili the are members of Gili Ecotrust. This group is in contact with the local fishermen and want to prevent the catching of sharks, rays and turtles. 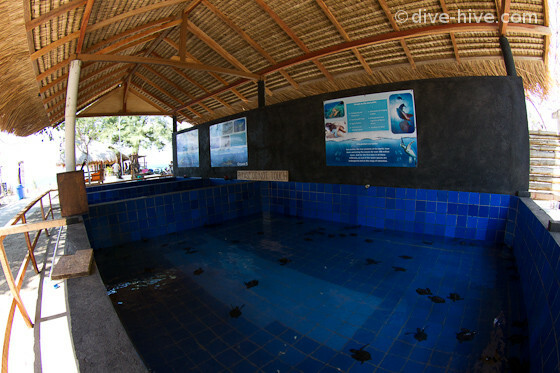 Gili is an absolute heaven for turtle lovers by the way. 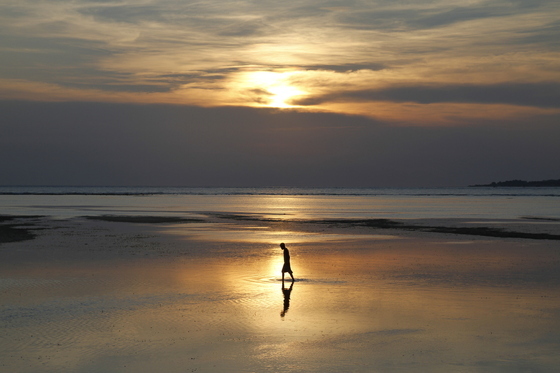 Gili is a marine protected area but fishing is still allowed. The fishermen have been there for generations and it is part of their living. At least there is no more ongoing dynamite fishing in the diving areas. At the moment ways need to be found to involve local people and work with them. Together with a couple of other dive centres Oceans 5 bought a Manta that was still alive tied to a fishing boat for 600.000 Rupia (about 50 Euro). It was of course not pleasant for the tourist to see this scene. So there was a talk with the head of the island and he forbid things like this to happen again. I would say that is a big step forward and a great win for the conservation part. Oceans 5 is also trying to attract researchers. Simone said this part is really important because as a specialist they have a voice to speak to the government. Furthermore a collection of rubbish has been started. Cans and plastic bottle for example are shipped to Lombok for recycling. A few weeks ago Oceans 5 was offered about 100 hatched Green Turtles. If they would not have bought them the turtles would have ended up probably in a soup. 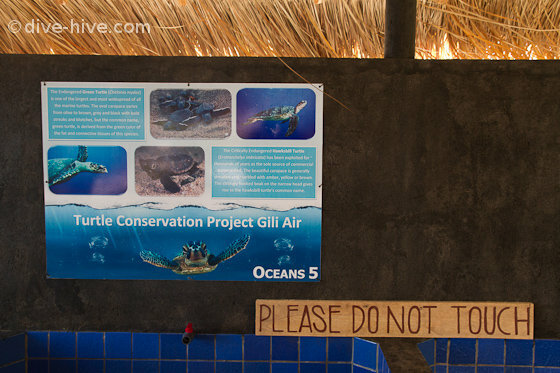 The dive centre made clear that this is a one time buy not to encourage the catching of more turtles. Anyway they took them in a started to build a little sanctuary. In there the turtles will be grown to a decent size and then released. Simone said that the turtles now at least have a chance. But there is little known about small turtles what is often referred as the “lost years”. With a decent size Simone ment that they are not floating anymore at the surface but start to dive and stay under water. Starting with this age they are a less easy prey. 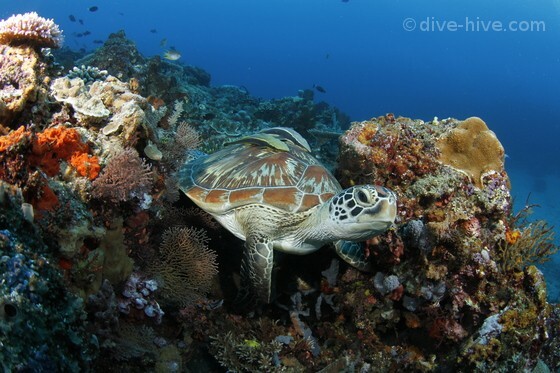 In another basin of the sanctuary lives a little Hawksbill Turtle. This one was brought in injured and had an infection at the mouth. Simone said the little Hawksbill is doing great. The infection is gone and the turtle is eating, swimming and sleeping. 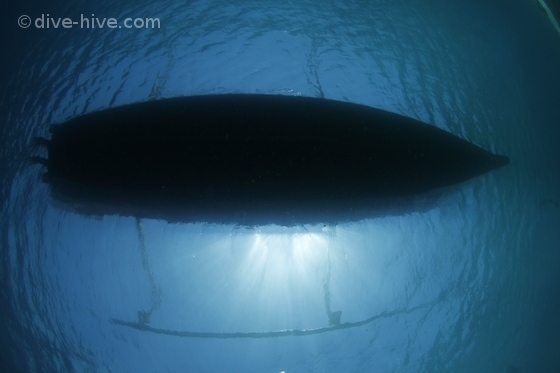 A few more weeks and the tiny patient will be ready to be released into the ocean again. The long term plan for the sanctuary is treating injured turtles and taking in confiscated ones because of illegal fishery. As already mentioned you get free water and coffee. The dive centre itself and the bungalows are just beautiful, very clean and can be recommended without hesitating. The equipment is in awesome conditions and one rule at Oceans 5 is that a group of divers should not exceed the number of 4. 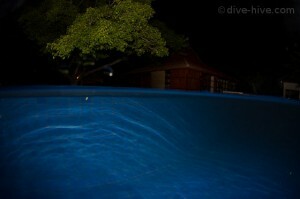 Small groups, experienced guides that love their job and this tropical island = perfect holidays. A big thanks again to Simone, Sander and the rest of the team. We will come back for sure one day to enjoy Gili Air again. The islands and the dive sites have so much to offer like Blue Ringed Octopus, playful Sepia and we had the rare luck to watch a Blue Spotted Stingray at a cleaning station.